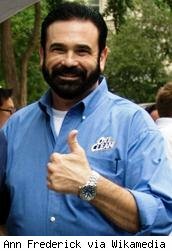 Billy Mays called iCan the "most important product" he'd "ever endorsed," but he won't be pimping it any longer. TMZ reports that "Today (Aug. 13) is the last day you'll be seeing the late, great Billy Mays endorse health insurance -- the company behind one of the legendary pitchman's most recent commercials has officially pulled the spot off the air. . . For the record, the company did get the OK from the family to continue running Billy's ad -- and Billy's son also made the following point on his Twitter page, "When actors die, their movies continue to play, right?" But here's the problem: Would a company selling a health insurance product really want it's pitchman to be a guy who recently died at the age of 50, with the autopsy report suggesting that cocaine was a factor? That's the problem. When that autopsy was released, Mays' family said it was "extremely disappointed" that the autopsy had been released publicly. "We were totally unaware of any non-prescription drug usage and are actively considering an independent evaluation of the autopsy results," they said in a statement. They also said that the report "contains speculative conclusions that are frankly unnecessary." And now we may be seeing at least part of the reason why they're so upset: The cocaine allegations have cast a cloud over Mays' legacy, and that'll impact the long-term income stream his estate will benefit from. TMZ reports that "Today (Aug. 13) is the last day you'll be seeing the late, great Billy Mays endorse health insurance; the company behind one of the legendary pitchman's most recent commercials has officially pulled the spot off the air. For more as seen on tv reviews, click through this gallery.